It is a special time of year for guests staying at Honu Point on Kaweonui Road in Princeville, Kauai, Hawaii. 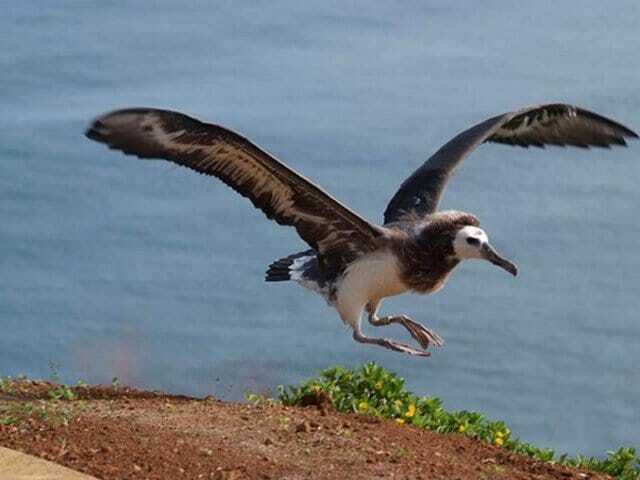 The Laysan albatross chicks who were born in January are very busy practicing to fly. We have ten in the neighborhood and it seems that no matter what time of day you drive by one of them is spreading its wings to test the air flow. Yesterday I stopped to take three videos. The first two are right from my car as you can tell when the chick decided to check out a piece of frond in the road. These chicks have stayed very close to their nests for six months with mom and dad flying in to bring them food. The only baby fluff left is on their chest and head. The rest of the body is covered in flight feathers. They have not seen the ocean yet but in a couple of weeks they will find their way to the bluff and take a giant leap of faith. From there they will head out to sea for three to four years, flying about 1000 miles to find and catch their first live food. To get ready the albatross chick raises and lowers its huge wingspan to test the wind, running down the side of the road. You can see how unsteady they are at this point. The cutest part is when they start taking little hops to get airborne. Keep in mind that they never actually fly until they jump off the bluff. In years past we have had at least one chick per year jump from our property, Honu Point. 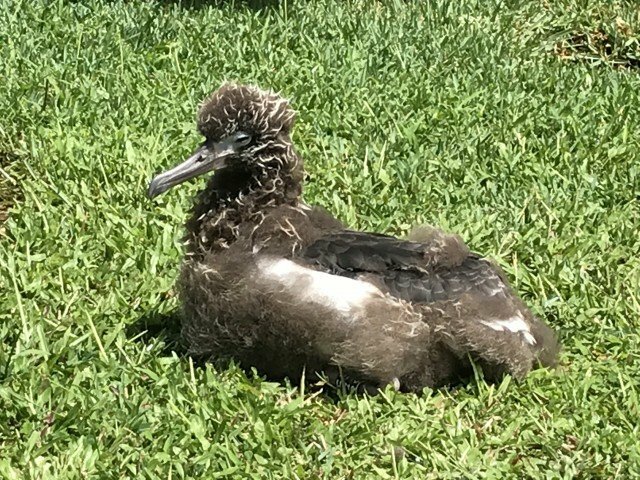 Vinney fledged from just outside Honu Point’s master bedroom in 2015. An author and neighbor took this great shot. We are waiting for Vinney to come back. 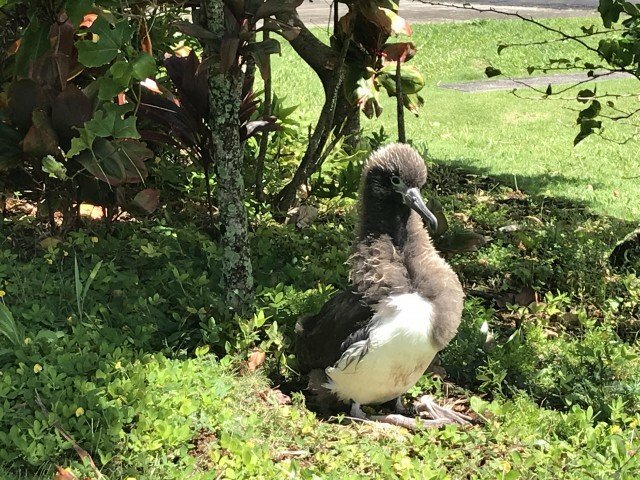 So, if you are visiting Kauai from January to July, be sure to take a drive around Princeville to get an up-close and personal view of these amazing birds. If you are lucky enough to watch one fledge it will be an event to remember, for sure. For more of my blogs, or to subscribe, go to the right hand side of this page. Mahalo! 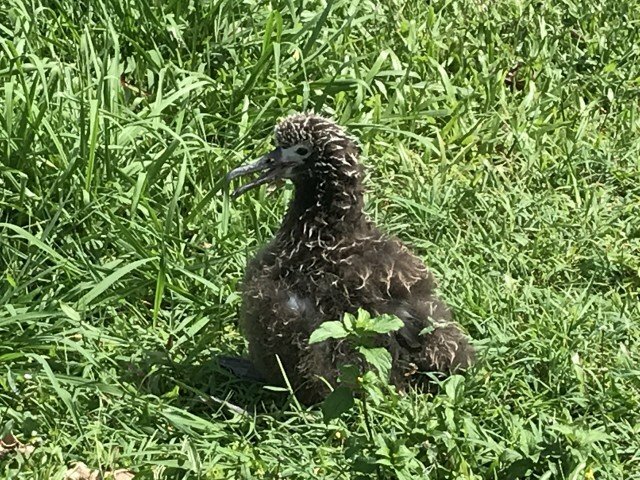 If you follow my blog then you know that I LOVE the Laysan albatross chicks in Princeville, Kauai, Hawaii. 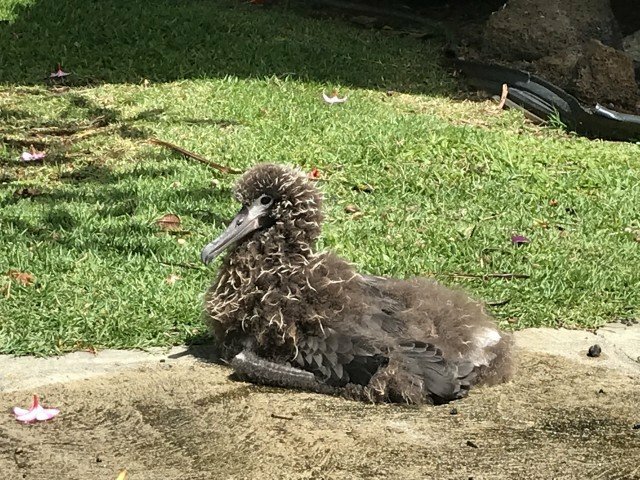 Moana, who was recently banded H712, and lives just four houses down from Honu Point, posed for me in his/her awkward stage of loosing fluff to flight feathers. All the chicks in the neighborhood are now about four months old and they are starting to wander a few feet further from where they were born. They are also testing those long wings to see just what they do in the wind. Each wing gets folded in four parts before it rests near the body. As I was driving away from Honu Point on Wednesday another chick was having a very good morning. Mom or Dad had flown back to the island with lots of food to share. It had been quite awhile since the last meal and he/she was hungry. Even after I stopped filming, the chick kept trying to get more and more regurgitated food until finally the parent said enough and walked away. Best with sound. Here are three more cuties in the neighborhood. Each one is at a little different stage of development but they will all be fledging at the end of June or into July. Between now and then they will continue to spread those wings and start running down the street to practice their take-off. Perhaps they will get an inch or two off the ground but that is it. Not until they take that giant leap of faith off the bluff will they actually fly. Once these Laysan albatross leave our island they will stay over water for three to four years. Then, as long as they can stay safe, they will return to our neighborhood and we will know who they are from the band that was placed on their leg. 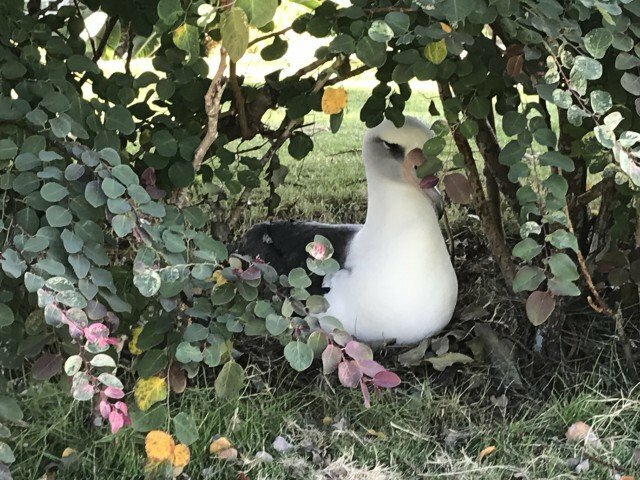 Our neighbor, Cathy, who you may see walking every afternoon to document the lives of these fascinating birds, has a very long family tree of the albatross of Kaweonui Road. How can anyone not love these birds? With all of the media coverage of our flooding last week, some of you have expressed concern about the albatross chicks on Kaweonui Road. Rest assured, these little guys are doing just fine. Today was the first day in a long time that we had broad sunshine first thing in the morning. I was preparing Honu Point for our next guests and decided to snap a few photos of these babies in four of our neighbors’ yards. This one is Moana. The albatross chicks are now about three months old and halfway to the time they will fledge. Soon they will be growing flight feathers from the bottom side up. In another month or two they will be pretty funny looking with half of their bodies covered in flight feathers and the other half still fluff. 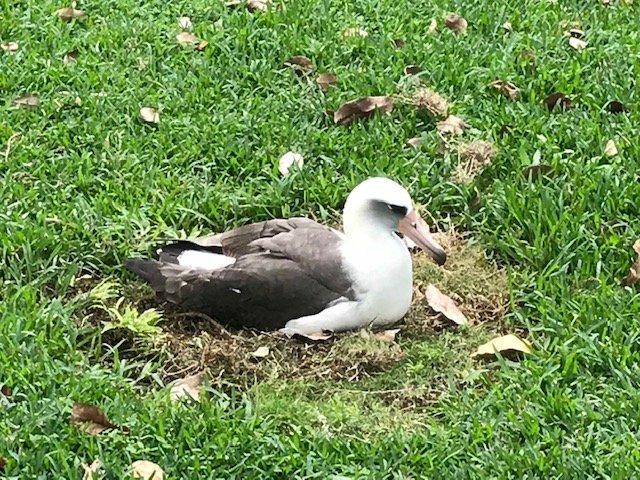 Bird Watching on Kauai – Watch the Laysan Albatross Live on Bird Cam! 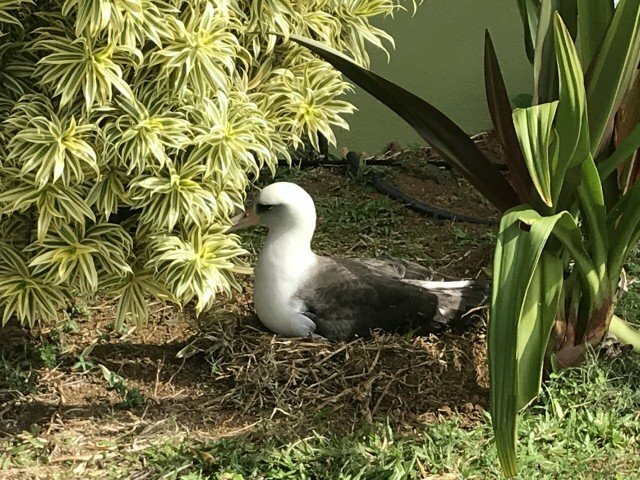 For the fifth year in a row, the Cornell Lab of Ornithology has set up their “bird cam” on Kauai in order for the world to be able to watch the Laysan albatross nest and have their young live! We have at least eight nests within a block of Honu Point Vacation Rental, but the camera is set up on another north shore private property not too far away. 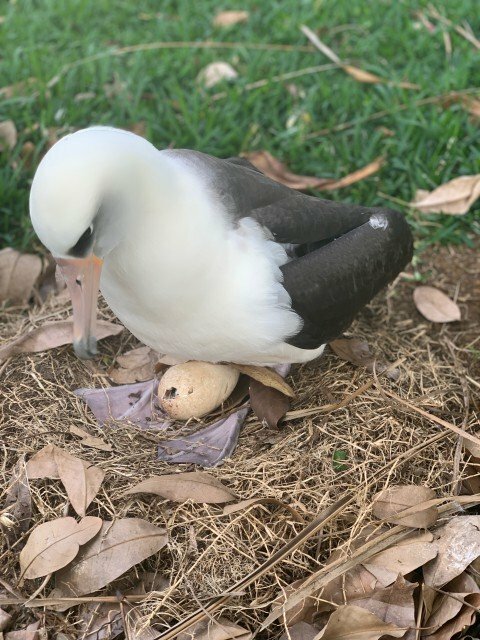 The Kauai Laysan Albatross bird cam started rolling today, with three nests featuring all-new breeding pairs for 2018. Take a virtual trip to the north shore of Kauai and watch along as all three nesting pairs wrap up their 2-month incubation and prepare for hatching before the end of January! The first egg is likely to begin hatching tomorrow, Friday, January 26th. Tune in now to experience the hatching of these magnificent seabirds live on camera! Yes, today was another drop dead gorgeous winter day in Princeville, Kauai; warm temperatures, clear skies and a slight breeze. From the lush, green mountains to the white water swells I just had to share. This video was taken by me at the end of our peninsula. And, just to add some excitement to the spender, we have at least four albatross nests within five houses of our property. One parent stays on the nest while the partner goes off for food. Then they exchange places. This continues until the chick emerges from its shell and is old enough to stay warm without them. Princeville is the only place in the world where albatross nest among people!! To highlight the day, as I was wandering around taking photos, I caught two young albatross trying to “hook up” with each other. Enjoy the dance (be sure to have your volume on). These magnificent birds stay in the neighborhood until their chicks fledge in July. They definitely add to the enjoyment of a winter or spring vacation on Kauai. Come stay at Honu Point and you, too, will be able to have this “bird’s eye” view. For more detailed information about the Laysan albatross, see my previous blog written one month ago when I was anxiously awaiting their arrival.